Prometheus is a music synthesizer and sequencer. I wrote this originally in November 2002 but have continually updated and upgraded it over the years. Essentially, Prometheus is a plug-in based synthesizer and sequencer inspired by Tracker software, such as Protracker on Amiga. All plugins are custom designed and I've coded every aspect of the software from basic sample playback, to all of the filters, delays, reverb algorithms, equalisers, MIDI integration, vocal processing, and every other digital sound effect. Prometheus works internally in floating point digital data in two (normal stereo), or six channels (left, right, front, back, up, down), which could be used for full 3D spatial audio, or for complex live performances that would benefit from a six speaker layout. 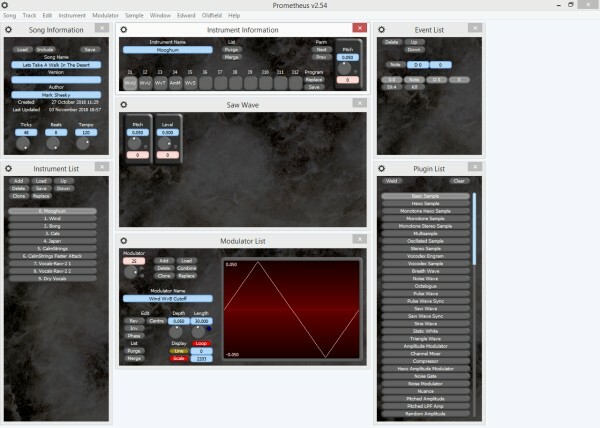 Prometheus works as a synthesizer, sequencer and mixing desk, such that all of my music since 2002 has been generated, or subsequently produced, by this software. It also includes several music generation systems and artificial intelligences to aid composition. The album Pi used a feature that could import a list of numbers as notes to import the digits of pi as music, and Art By Machine used a major subset of the software called Oldfield 1, to generate entire tunes from scratch, using simple rules based artificial intelligence. There are no plans to publish this software at the moment. I created this primarily as my own tool. It lacks some Digital Audio Workstation features, such as VST support and live MIDI input, and the work of publishing and supporting complex and expensive utility software is considerable. Prometheus is the second generation of my software Noise Station. Noise Station is available as a free download on this site.